Sold by Hamans Outdoor Store and Fulfilled by Amazon. Gift-wrap available. A great option for 2 adult hikers. 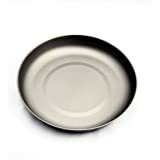 I'd go down a size or two--probably to the 1100ml size--if I regularly hiked solo and still wanted a frying pan...not so much because of weight but because I'd want to reduce volume in my pack. - Fits two full boxed meals comfortably. For example, 2 boxes of prepared Mac & Cheese would fill two-thirds to three-quarters of the pot. One would still need to be judicious with the amount of water used to boil the pasta of 2 boxes together. There's plenty of room for enough water, but it makes boil-overs a little more likely. We err more toward using just enough water to get the job done. - Check YouTube for a couple nice reviews with size comparisons. 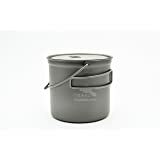 - Works nicely with my Coleman Compact Dual Fuel Single Burner Stove. 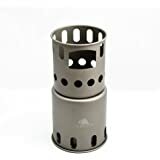 The burner is wide enough to support the whole pot well and the wide burner ring distributes the heat more evenly on the thin metal. - The pan is wide enough to fry cut-in-half bacon slices. It'll also fry 3-4 eggs at once: 2 eggs is easy, 4 eggs is a tight fit. With the stove in simmer mode, it's pretty easy to fry eggs and bacon. I start with the bacon and move it/turn it often to start with in order to get a decent layer of bacon grease on the bottom of the pan. Once there's enough bacon grease, the bacon deep fries, essentially, without much sticking. Using a good amount of bacon grease, I cook the eggs the same way...allowing them to float/boil on top of the bacon grease so that they don't stick too much. I'll also pick the pan up by the handle and move it around to get heat where I want it or to distribute the bacon grease where I want it. - My July 2016 purchase has gradation marks in ounces and milliliters. - Clean up is reasonable. The bottom of the pan and pot have nice, gentle curves so food doesn't get stuck in them. Food releases pretty well by boiling a little bit of water in the pot or pan. 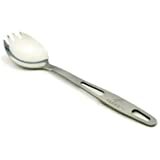 - I can use my TOAKS Titanium Spork but it's a little short. - The handles on the pot overlap for a more secure hold. - The handles are removable. - It holds a lot for storage...sporks, coffee, cream, eggs, Pour Over Coffee Dripper, napkins, etc. - The pan doesn't really fit well on the pot as a lid. It's not a secure fit and will move around. It can rather easily come completely off (because the metal is slippery) and fall on the ground. We will sometimes turn the pan over and put the smaller diameter side down as the lid--kinda like a plug. It'll recess into the pot a bit this way. It does the job just as well with a lot less risk that the pan will fall on the ground. - Because the pan doesn't lock into place, it won't stay together in my pack without the storage bag holding it in place. - The pot does not nest in the pan. - The handles get a little hot if the stove is on high and heat is rolling up around the sides of the pot or pan. A paper towel, bandanna, or buff is useful. With the stove on simmer, I can touch the handles without a covering. - It's thin metal, so heat transfer is nearly instantaneous. That's good for boiling water but not so good for cooking/simmering. We resort to controlling heat by picking up the pot or pan and moving it into or out of the flame as needed. It's all a trade off. 4.0 out of 5 starsIt's a decent product. It's light and reasonably durable. My Toaks 1600 ml pot came with volume measurement marks on the side. I like the functionality of a frying pan lid as it functions as a trivet, a plate, a bowl, and a fry pan. You do have to be careful with the fry pan handle as the handle mounts are thin and delicate and prone to bend or distort when handled roughly or without care. The fry pan lid does not fit snug and falls off the pot easily when moving about, but I suspect that may be the reason for the included sack. The fry pan lid does fine as a lid during boiling. My fry pan bottom distorted slightly after getting hot over flame and now rocks a little on flat surfaces. That does not effect the function, and when backpacking, what flat surface is to be found? The handles on the pot and fry pan are otherwise sufficiently sturdy, decent to grip, and insulated. Perhaps the handle insulation will not survive when stuck into hot coals, but I'm more apt to put the actual pan or pot into the coals and believe the handle insulation would survive in that context though not in a foundry. Toaks does offer a 1600 ml with a conventional lid for slightly less, and for half again the price a version with a conventional lid and a bail handle. One of the first things I did was drill holes in my pot. Just under the rim of the pot above the handle and directly across I drilled 2 mm holes and now I can poke a bent stainless steel bicycle spoke into one side, pull it through to the head, and pop the other end into the opposite hole. I can even pour using that handle with a full pot! The improvised bail handle does not work with the fry pan lid in place, but packs without interfering with the fry pan lid when in place but folded to the side, or when removed and dropped into the bottom of the pot. 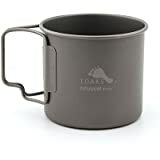 I can put the pot on my Fancy Feast wick stove and get 48 oz of water to a boil with a couple oz of denatured alcohol and get a couple mugs of coffee and a couple bowls of oatmeal from that, and fry eggs and bacon with the fry pan on a bushbox ultralight stove burning dead fall. The fancy feast wick stove with a remote fuel bottle and this pot capped with the fry pan should also be nice for melting decent quantities of snow! I have given it 4 stars only because of the lack of material connecting the fry pan handle to the fry pan. 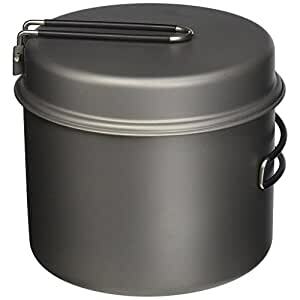 5.0 out of 5 starsExcellent Cooking Pot and it has graduation marks!! 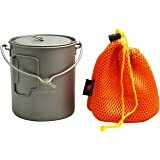 This pot combined with a Clikstand and a Trangia burner makes an excellent backpacking cooking setup for actually COOKING a meal instead of just heating/boiling water. The fry pan works well on low heat for pancakes and eggs and can cook up sausage or bratwurst pretty well on a medium heat setting. My only dislike is that there are no measuring marks for liquid etched or imprinted on the side of the pot. Other than that, this is a good buy and the pot and pan should last for many many years. NOVEMBER 2016 UPDATE: I've been using this pot now for several years and I absolutely love it for backpacking! I've since purchased another one of these in October of 2016 and they now have the graduations marked on the pot! !